I wish I could run every single day… I love it that much! But age has its advantages, and one of them is wisdom; and if my body is too old to run everyday, at least my brain is wise enough to realize it. I remind myself of the common signs of overtraining, and use those signs to help me remember when I might need to cut back on my training. Today I want to talk to you about overtraining and how to recognize if you might be exercising too much I remember way back to when I trained for my very first marathon and my legs felt like lead when I got to the top of the stairs after my twenty mile training runs. Eventually that went away as my body adapted to the new demands that I was putting on it; but if this had been persistent, it could have been a sign of over-training. Starting a new workout plan, especially one as demanding as training for a marathon or triathlon, puts levels of stress on the body that it’s not used to dealing with. We have to gradually increase our workout levels allowing the body to adapt to each new demand. Too often in the excitement of starting a training program, we forget to listen to our bodies and we do exactly what our training schedule says we should do on that given day. Failure to listen to your body for feedback, can lead to over-training; and over-training can lead to a number of problems (i.e. injuries), some of them serious. Whether you’re a newbie or experience athlete, you should be aware of these ten signs of over-training. When in doubt, err on caution. Taking a couple of days off to let your body recover will most likely do far more good than harm. Rest is a good thing… a very, very good thing. Have you ever felt like you were over-training? If so, which of the above symptoms did you experience? How many hours of sleep do you need/get per night? This post could not have come at a better time!! 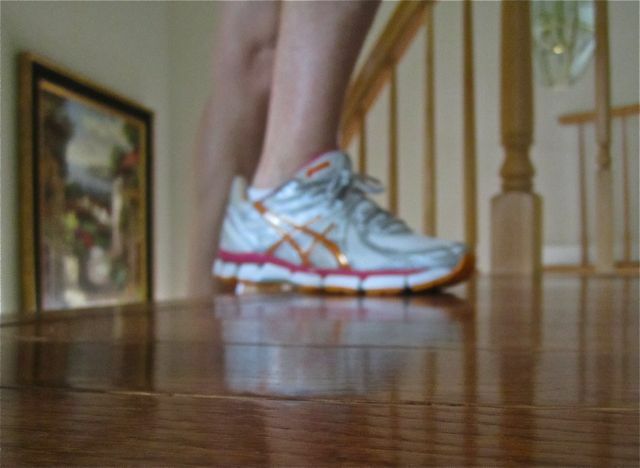 My Achilles Tendon hasn’t hurt for about a week now, and I was planning on starting up running again! This post reminded me that I need to ease back into running slowly……something I may not have done if it wasn’t for this reminder. Thanks!! Ease back in carefully and ice it after your runs. It’s been two weeks since our 12-miler on the concrete boardwalk… Have you been able to run at all since then? Call me if you have any questions. I haven’t done any exercise since our 12-miler. I will probably try exercising today or tomorrow and give you a call sometime this week!! Great post! I think overtraining is one of the most common mistakes runners make. It took two major injuries for me to learn to listen to my body but eventually I did and I havent had a serious injury in years. Thanks for this post! Good to know I am not over-training. In my previous training for my half marathons I always would over-train at some point during my training. I wasn’t running smart and not listening to my body at the time. I am happy to report that this year for my last 2 halfs I haven’t over-trained and feel stronger than ever. I get about 6-7 hrs of sleep. You’re welcome! I’m glad you’re listening to your body this year and staying strong. 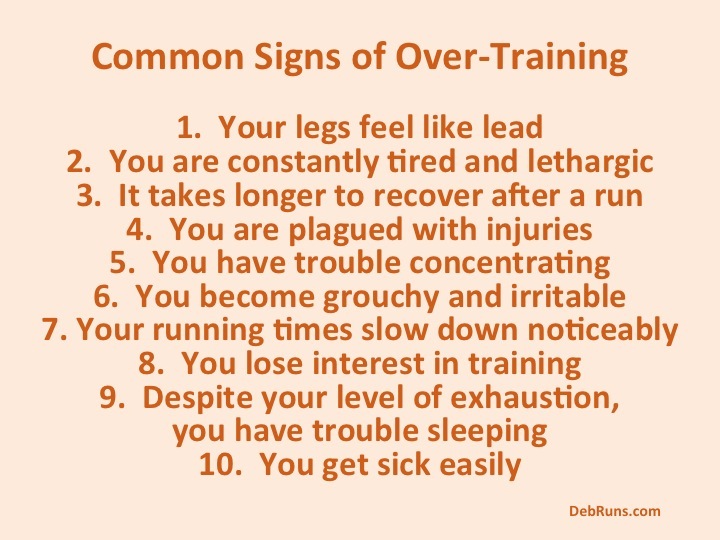 Those signs of over training are great to keep in mind as I progress in my marathon training. I have had a rough couple of weeks, but I am still having a good run or two each week. I think a big part of it is the humidity and the fact that I have been running five days per week for the past six weeks, which is new for me. As I build my mileage I expect I’ll be walking a fine line between training my body to adapt to higher mileage and over-training. It is a fine line especially when training for your first marathon and going into unknown areas with your distances. Don’t baby yourself, but DO pay close attention to how you are feeling overall. Taking a necessary day off here and there won’t derail your end result. Ahhh! You post this a mere 2 days after my 3-day running-hiatus! Right now I’m considering whether or not taking on the Intermediate training plan from Hal Higdon was overdoing it. Should I switch over to novice? My friend (currently training to run her 8th marathon in Detroit) has always used the novice and is just fine with it! Thanks for the information. You’re always good to turn to for great advice! I overdid it once. My heart started racing even though I was lying on the couch, that’s what tipped me off. That can be very scary! I hope everything turned out okay and that you recovered quickly. I’ve definitely experienced 1, 8 and 9 from over-training. It took me a bit to realize it was because of that, but once I did, and eased up a bit I started to feel better. I need to get at least 6 hours a night to be a nice person the next day, but try to get at least 8 if possible. Thank you! Glad that you figured out what was going on and were able to get your training back on track.